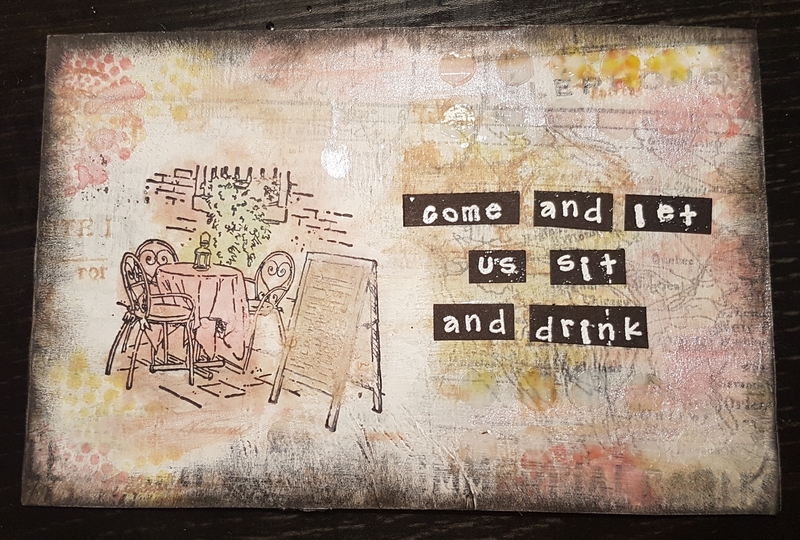 Another postcard swap… and this time a choice of drink for the theme! I decided to go with the idea of a cafe when I spotted the stamp on Mediterranean Moments. I started with a piece of packaging and added gesso in both white and black. I then added the Tim Holtz tissue wrap using the Matt medium. I then started adding the distress oxides and then used some more gesso in one patch in particular where I then stamped the image. Around the edge of the image I added more stamping using the distress oxides. I also added some edging with the black gesso. I then stamped and heat embossed the title. Finally I added some clear texture paste through a stencil. Hopefully the recipient liked it. Love how this turned out. Excellent piece of work.